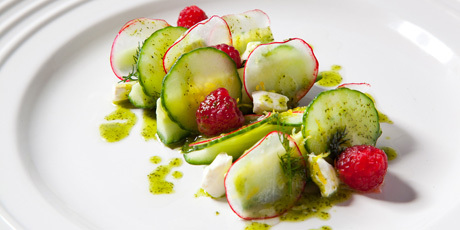 The taste of dill married with English cucumbers, radishes and fresh raspberries. 1. Arrange arugula and cucumber batons on plate. 2. Stand radish and cucumber discs vertically on late, leaning on cucumber batons. 3. Crumble cream cheese strategically around the salad. 4. Arrange raspberries and dill sprigs on salad. 5. Dress with dill dressing around and on top of salad. If desired, very lightly sprinkle fleur de sel over top of salad. 1. In a blender, puree vinegar, dill, and sugar. Slowing add oil until mixture is emulsified. 2. Turn off blender and add salt to taste. Refrigerate dressing for 6-8 hours to allow flavours to combine.